Come relax on the deck and hear the creek rush by in this beautiful 3 bedroom 3 bathroom log cabin. The cabin is comfortably furnished sleeping up to 9 people with a queen in the master bedroom (main floor), a full bed and twin daybed in the loft, a twin in the downstairs bedroom, a queen sleeper sofa in the downstairs rec room. 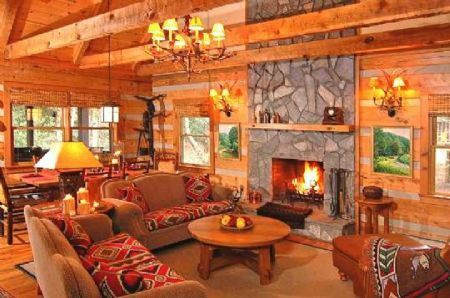 This cozy log cabin offers a well appointed kitchen, two living room areas, with a TV on the main floor, the downstairs living room area, and the loft, a washer and dryer. No smoking allowed. Air conditioning not available in this unit. Four wheel drive is recommended for the winter months. The cabin itself is amazing!! I would recommend 1 upgrade... the TV’s. We are a huge NFL family. The cabin was amazing and a great location. We were extremely disappointed in the TVs. We are a NFL family, with the playoffs this past weekend it was difficult to watch the games on such small and outdated TVs. We were looking forward to watching football and Netflix, but with the TVs it was difficult and impossible to do either. Close to Blue Ridge Parkway, Tweetsie Railroad, Grandfather Mountain, Ski Resorts, Hawksnest Snow Tubing & Ziplining, Linville Falls & Caverns, Gem Mining, Fishing, and so much more.